Buy the Super Comfortable VForce Profiler at Amazon NOW! Don’t let the fact that this mask has a single pane lens discourage you. 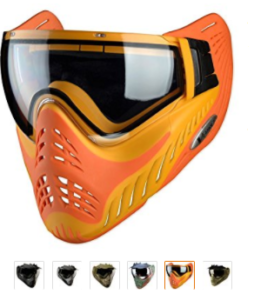 If you delve into the many reviews for this mask, you will see that the single pane lenses are actually the preferred choice of lens for those who play Paintball in bright and sunny conditions, like in Florida for example. For reasons we don’t know, a single pane lens holds up better against fog when used in bright sunlight. 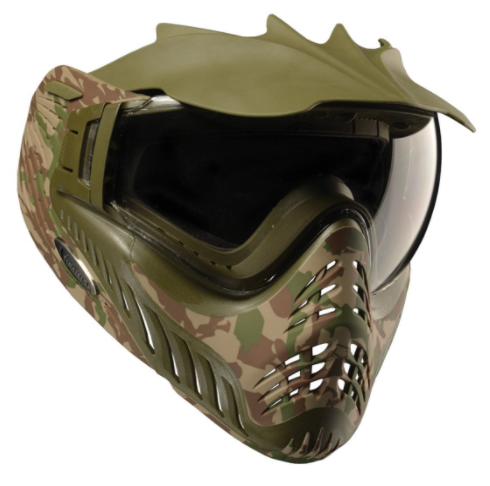 VForce definitely seemed to have intended this mask specifically for paintball players who play in sunny conditions as it is comes with a neat little visor that prevents that annoying glare that can ruin your aim. If you however play in cold or cool conditions, you might be better off buying a mask with thermal dual pane lenses. Or, you can just buy a dual pane lens for this mask itself. The Profiler is a very comfortable mask to wear. Incredibly light and with fantastically comfortable straps, you can wear this all day long and pretty much forget that you have a mask on. It also has a fairly low profile and lets you get down to the sights well, though not as well as the Empire EVS or the Dye iSeries masks do. While the JT Spectra retails for a similar price with a dual pane thermal lens as the default lens, the JT falls short when it comes to wear comfort. The Profiler is just incredibly comfortable and it also accommodates larger than average heads, while the JT is very unforgiving. Also, the Profiler allows you to change lenses in less than half a minute while the similarly priced JT Flex will need you to spend 3-5 minutes before the lens can be swapped out. Buy the VForce Profiler if you need to wear a mask for very long periods of time, while wanting great comfort. There’s a reason why it is called a Profiler mask. Though it comes with single pane lenses, it does an excellent job of protecting against fog, especially in bright and sunny weather when the inside of the mask can get pretty hot. You can also always buy a thermal dual pane lens for this mask as well, to use in weather conditions other than sunny and bright. Check out the VForce Profiler at Amazon, here.